The first victims of the violent attacks this past November in Mumbai, India, were a sniffer dog named Jessica and her "handler." The attacks, targeting the Taj Mahal Palace & Tower and the Oberoi-Trident hotels, began when four terrorists entered the Taj and immediately killed Jessica and her human, who were shot dead as they were guarding the back entrance of the hotel where the terrorists gained entrance. As the night wore on, bombs and grenades exploded where the pigeons roost on the Taj, causing them great distress, as the image of the birds fluttering against the flames was captured on TV. 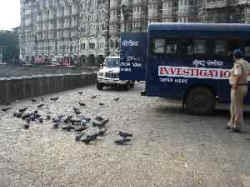 For nearly three days IDA India staff could only watch the suffering pigeons from afar. And then, when the last terrorist was finally killed, IDA India President Goodicia Vaidya and a volunteer seized upon the opportunity to drive down to help the pigeons. Before setting out, they contacted Mr. Vora of Paras Hardware, a trustee of the Dadar Kabutarkhana (a place designated for feeding pigeons), who, upon hearing about their mission, very generously donated a 50 Kg. sack of grain for the Taj / Gateway pigeons. When Goodicia and the volunteer reached the heavily guarded destination, they were not permitted to park and had to find a space far off. After unpacking some of the grain they walked back to the Gateway, where they came upon the media, the NSG commandos and Rapid Action Force soldiers, along with fire brigade personnel and policemen, as well as a few curious onlookers. At first they weren’t allowed to proceed, but after showing the grain they’d brought for the birds, they were allowed entry into the cordoned-off area. And what a welcome from the hungry pigeons, who flew onto their heads, shoulders, and the bag of grain. Goodicia and the volunteer then picked up the birds who were sick and injured (one had his neck feathers singed) and took them to the BSPCA Hospital where they are still being treated. Goodicia and the volunteer returned a few weeks later and, with police permission, they emptied out the remainder of the sack for the pigeons of the Taj. They will return again soon with some more grain. 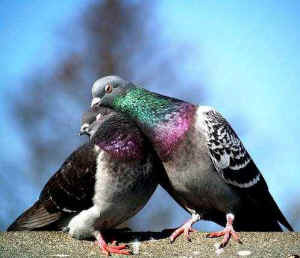 The pigeons are cooing with delight once more.